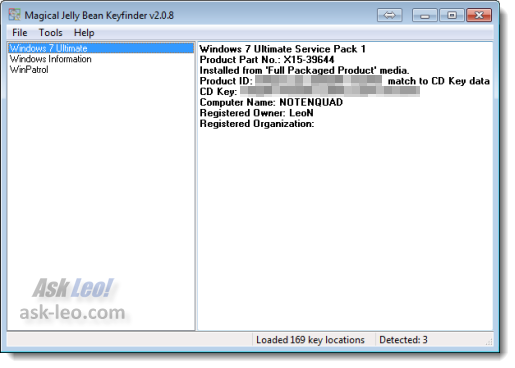 Keyfinder from Magical Jelly Bean is a free utility that will display your Windows product key. Be sure to say "no" to the additional toolbar that the Keyfinder install offers you. I've obscured my information, but you can see where your CD key would be displayed. Keyfinder is free and works primarily only with Windows keys. On the download page, they do offer another product which is not free, which claims to display product keys from a wide variety of products. Belarc Advisor is a PC auditing/inventory tool that actually displays a lot of information about your computer. Download, install, and run Belarc and it'll start by taking a few minutes to analyze your computer. When done, it displays its results in a local web page in your browser. To the right is an example of the report generated for my machine. As you can see, it's quite lengthy and includes a lot of information about the machine, its hardware, and the software that's installed on it. Once again, I've obfuscated my own keys, but you can see that Belarc displays keys for a wide variety of installed programs. Write down all of your keys and keep them somewhere safe. Now. Before you need them. In many ways, product keys are the product. It's not uncommon for the software to be readily available, but without a product key, it either won't activate or will deactivate after a trial period. Don't lose your keys! When you purchase software you're not always buying what you think. How do I back up my installed software? Backing up installed software often happens with system backups, but it's not enough. You need additional steps to properly backup installed software. In my experience, if you're trying to get the key from an OEM installation (HP, Dell, etc) you will get the manufacturer's key which is tied to the manufacturer's installation media - you're going to need the key from the OEM sticker and an OEM disk of the correct version (professional or home) to be able to do a reinstall. if you have the cd but not the key, open unattend.txt in i386 folder, and you will see the key there. I also store the key numbers of a new product. I usually copy the installation CD or downloaded file to a hard drive sub-directory and also create a text file with the key, purchase information, invoice number and activation codes. If much of that is in an email, I'll save it to that same sub-directory with the CD or installation files. Then I can backup that sub-directory onto a CD or DVD for archival purposes. I end up with "all pertinent information" in one place. I have had great success with Belarc Advisor. Not that I've ever needed the information, I notice that it will display the product key for every program I have installed, whether it be Windows/M.S. related or any other software. I imagine if someone lost their key(s) this would be a great help. Of course, if you don't have access to the running system, you're out of luck. SIW (System Information Windows) is another another good free package for at home users that will tell you the product code for your current MS OS. Quick note about Keyfinder...I've used it for years so I trust it but Symantec Endpoint doesn't. I used to save a copy on our server but nightly scans caught it and I believe it must be a heuristics detection and not from a "naughty list" (meaning, Symantec just "thinks" it's bad). I still use it. I just don't store the file on the network anymore. I have found Belarc to be an invaluable tool, especially for finding what 'versions' of a particular program may be installed. But, of hundreds of times that I've used it, not once has the Windows key or a Microsoft Office key been correct. Please don't rely on these keys unless you have double-checked the results with a second, different program. Once you format the drive, that info is gone! Leo, thanks for the information on Belarc Advisor. I have been looking for an easy way to document this information for all of my computers and just ran Belarc Advisor on my desktop. Wow! What a nice report. I was not a subscriber when you posted your first article on this utility in 2008, so I missed out on using it. I have used Belarc and found it not always reliable in that it doesn't always give you the correct key characters. I have relied on AIDA32 (a free app) and found it to be 100% reliable. A good feaure of AIDA32 is that you do not actually install anything on your computer it will run from a USB whereas Belarc must be installed. I think the only times I've encountered the same problem as Dave Markley, is when the machine has been 'downgraded' from Windows Vista to Windows XP. Aside from those one or two instances, I've found Belarc to be 100% reliable. http://www.belarc.com/free_download.html - not only does Belarc extract product keys, it reports on a WHOLE BUNCH of other stuff you want to know. Printing the report, or saving it is probably a good idea. ProduKey may be able to extract product key information from a registry file saved externally. This is useful if you’re trying to get the key details from the backup of a now defunct machine. Try the /Regfile option. Advanced Token Manger - Tokens.dat works as a digitally signed file, which stores the majority of the windows activation files. In Windows 7, can you use the Windows.old folder that the installer made to regain that product key? This article prompted me to check all the product keys I've saved. I found I have the keys from stuff going back to DOS 6.22 and Win 3.1!! Ok. I'm sure I'll never need those keys again, but I'm hanging on to them anyway, JIC. I use Gearbox KeyFinder PRO for 32-bit keys and MSKeyViewer Plus for 64-bit keys. They're both free and they have worked every time for me. That 32/64 demarcation isn't exactly right, but using both always seems to extract all the keys. How about instead of storing your keys and activations somewhere remote, like a spreadsheet, just write them in permanent marker on the media. That way it can always be handy where it should be handy. And while you're installing from a CD/DVD, you can open the drawer and look at the key, then close it. Seems a little more practical and useful than having it in a spreadsheet. I've tried both Belarc and JellyBean. They both give you the same keys. These keys will not allow you to register Windows XP. The keys they supply, according to Belarc, are the manufacturer's key, and not the key that came with the disc that you need to register. I'm really upset with these guys. I had an older version of Keyfinder that was awesome. Worked every time. I downloaded this version, after reading the article and the comments, and found that it wanted to install "California Fonts" toolbar. There was no way to opt out that I saw. What a HUGE mistake! It decided to download the toolbar, put the toolbar in all the browsers I use (IE, Firefox & Chrome) and change the homepage on all three browsers as well. It locked up my machine and I couldn't stop it through Task Manager. I could go on . . . . I should say I have downloaded many utilities from Ask-Leo. I've followed him for many many years and have found tons of great information. This was the first time I ever had a problem with a utility he suggested. Once again, be careful with KeyFinder. That program wasn't suggested by Leo. It was an ad place there by Google AdSense. Leo doesn't have any control over the ads Google displays on the page.